Are you ready to 'flip the switch' to summer weather? Are You Ready to ‘Flip the Switch’ to Summer Weather? Both the words "cool" and "hot" appear in our latest forecast as New Jersey's temperatures increase significantly over the next few days. Hi, New Jersey! Our Thursday is beginning with light patchy fog, which is already starting to burn off as the sun rises. We'll see plenty of sunshine and blue skies through Thursday morning, pushing high temperatures into the lower to mid 70s across most of New Jersey. The beaches will probably top out in the 60s. While that will be fairly pleasant — just like Wednesday — it is still just below normal for early June. I'm keeping a leary eye on a storm system exiting the Carolina coast. It should miss New Jersey almost completely, as it heads in the eastward (out-to-sea) direction. However, I think some extra clouds are a good bet in South Jersey and along the coast on Thursday. Additionally, I can't completely rule out the possibility of showers drifting over the Garden State at some point — but I stress this is a slight chance. Along the coast, we've posted a "moderate" risk of rip currents on Thursday. Tidal guidance looks good — while I could see a few instances of minor flooding at the times of high tide, it should not be a widespread issue. As the storm system pulls away, we'll see clearing skies Thursday night. That will lead to some pretty cool temperatures in the upper 40s to lower 50s by Friday morning. Our recent bout of cool, cloudy, damp weather has been driven by an upper-level low parked over eastern Canada. As that departs, we'll see high pressure build in, with a switch to westerly and then southwesterly winds. That's going to be a warming wind, so temperatures will go from "early Spring" to "peak of Summer" within just a few days. Friday's high temperatures will reach the lower 80s. 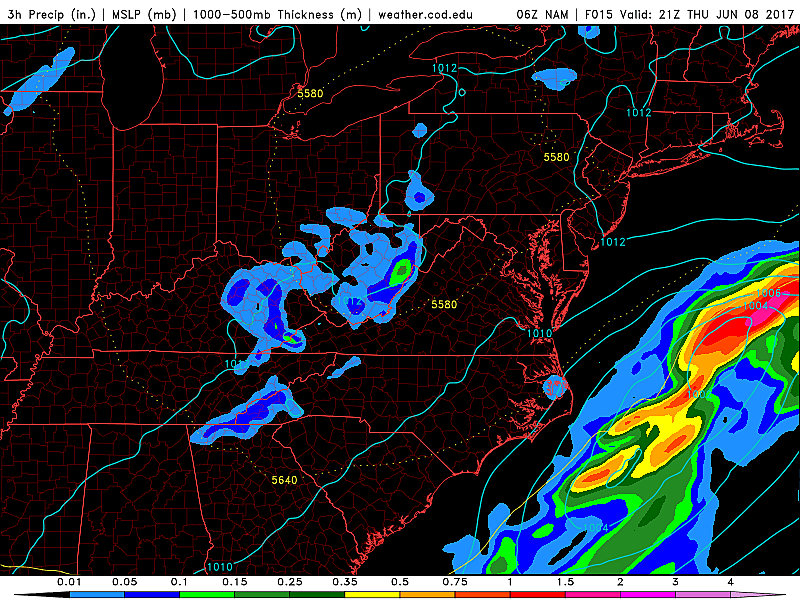 Models have been flip-flopping about a convective shower or thunderstorm popping up around dinnertime. The current outlook is dry. Saturday will peak in the mid 80s. Again there will be a chance for an isolated shower, mainly in North Jersey in the afternoon hours. And Sunday will bring upper 80s to lower 90s to the Garden State. So, according to my weather dictionary, we do have some downright hot weather on the way for early next week! Highs on Sunday will pop above 90 degrees across inland central and southern New Jersey. We might get a taste of the "blast furnace effect" with a brisk southwesterly wind over 20 mph. Monday will probably be the hottest day of this stretch, with widespread 90s for all but the Jersey Shore. And there could be a few 90s on Tuesday too. Although Tuesday's forecast also includes a backdoor front that will bring a round of rain and at least a slight cooldown. The forecast for Wednesday and beyond gets muddled, but I doubt we're going to sustain the heat beyond Tuesday as an on-shore flow returns. Source: Are You Ready to ‘Flip the Switch’ to Summer Weather?